The manager of Kay Kyser's band books them for a birthday party bash for an heiress at a spooky mansion, where sinister forces try to kill her. 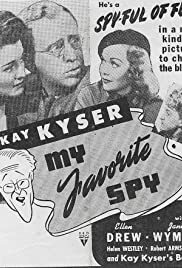 Radio sensation Kay Kyser and his band are lured to Hollywood to make a movie, but the screenwriters assigned to the project have difficulty tailoring a script to Kyser's persona. Comedy about an invisible man. A fictionalized biopic of composer Cole Porter from his days at Yale in the 1910s through the height of his success to the 1940s. Kay Kyser is late to his wedding. He is taking a short cut through Central Park when he finds out that he is in the army and is due to check in that afternoon. It turns out that the army wants him as an undercover agent because a spy is working out of The Orchid Room. Problems ensue between the agent who helps him,Jane Wyman, and his new wife. Also great comedy scenes in places he is supposed to meet his agent friends. You'll tingle when they tangle in Tangiers. Connie: Do you want to ruin everything? Kay Kyser: But she'll smother in there! There's not enough air. Connie: That ought to hold her. Whoever said that band leader Kay Kyser was a comedian? This Harold Lloyd produced opus proves that there is nothing funny about him. He looks a little like Harold Lloyd, but that's about it. This RKO comedy is well planned and has a funny premise. Lloyd provided for many belly laugh opportunities. The problem is that Kyser cannot deliver a punch line and is totally inept at physical comedy. William Demarest has a funny bit as a policeman doing battle with Kyser, but most of the humor is crushed by Kyser. Tay Garnett was not the best choice for director; he lets a number of slapstick possibilities escape. He makes the same mistakes in his later "A Connecticut Yankee in King Arthur's Court". The film would have worked if Lloyd has taken the lead himself, with a director like George Stevens handling the camera. What a pity!